I am NOT a tool collector*. 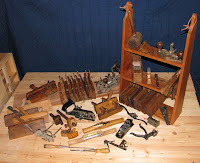 At right is a photo of all my antique tools. Rather paltry when compared with some folks’ stockpiles. I love antique tools, but I only buy ones that I plan to refurbish and use. Every so often, I come across a little beauty that begs to come home with me, regardless of whether or not I’ll ever use it. 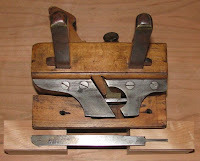 One such tool is this carriagemaker—also, coachmaker— plough plane (photos 3-5) that I purchased from Lee Richmond at The Best Things. A friend who knows way more about antique tools than I do, reckoned it was 18th c. because of the wedged, rather than screw, arms. The more ornate an d unusual carriagemaker planes (such as those in the second photo**), at least from my limited antique tool shopping experience, are hard to find. And the only information I’ve ever found about the planes have come from short paragraphs in a few ww books and articles. The one I boug ht isn’t very fancy, but other carriagemaker planes are among the most exquisite planes I’ve ever seen. Those are the ones I can’t afford. One such plane is the Falconer Plough Plane, of which only 3 or 4 exist. I witnessed one being sold at auction a year ago for $33,000. The skate on my plough plane is shorter than a regular plough plane because carriagemakers worked primarily with curves. The thumbscrew works the depth stop. The blade has little “wings” that I’m guessing act as nickers, but someone correct me if I’m wrong. Because of the thin width of the blade, I’m also surmising it was used to cut grooves for inlay. 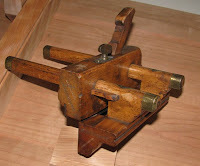 The only other carriagemaker tool I have is a little router (last photo) that cuts a delicate profile. Again, it came home with me because I liked the look and feel of it. But, you never know....maybe I’ll build a carriage someday and I can reinforce my claim of being a tool user, not collector. *I do not mean to imply that there is anything wrong with tool collecting. ** Photo is from Sandor Nagyszalanczy's book "Tools: Rare and Ingenious". Well, you left me jealous and realizing just how lackluster my tool collection is. That is a great find. All of your tools look like they are a pleasure to use. I love the idea of taking the old traditional tools and making them serviceable again. You're honoring the tradition of our craft in doing this. Thanks for the post, Kari! No matter how many times you say you are not a tool collector, it doesn't help, you are hooked. You have that old tool drug coursing through your veins. You will start to notice rust and you will start buying old tools that you may or may not use, but you have to have them. My name is Stephen S and I have an old tool problem. Stephen, you're probably right. I wonder if there is a TCA (Tool Collectors Anonymous)? Kari, when it comes to tools, it's not the size that counts, it's what you do with them. with apologies for turning your blog R-rated. Hahaha! Good one, Gary. I'm gonna have to look this tool up to try and figure out exactly what it's use was. Also, I'd have to agree with the peanut gallery. YOU have a PROBLEM with old tools. The first step to a overcoming that is to admit it. I'm not really sure, but I think there are about eleven more steps after that. Vic, it's not a problem if you don't admit it. haha! If that's your antique "tool collection", sorry, it doesn't register on the Tool Collection Meter. Awesome, Bill. There's still hope! You mean to say if every four or five years I send a dozen boxes of tools out to auction, therefore I have a problem? I prefer to think of it as forced savings. I get a higher yield this way than I do from my bank account. Plus I get to paw over my goods and drool a bit. Cept for the carriagemakers tools which I usually keep. Did you know that many called carriagemakers tools were for sash makers? Gary, I think you should blog about carriagemaker planes and if you ever decide to part with any of yours, please let me know. I have a magnetic attraction to them!